When Kieran from Ice Cream Ireland put out the call for ice cream testers earlier this month, I knew I had to jump in and help out. I had already made one of his recipes for Cinnamon Latte Ice Cream (see my post about it here), with great success, so I decided to stick with the coffee theme and select his Coffee Kahlúa Ice Cream for testing. This ice cream has a rich custard base with real espresso and Kahlúa for flavoring. I decided to serve my first batch with hot fudge sauce and almonds (picture above). The espresso flavor in this recipe, unlike a lot of recipes I’ve seen or used, comes from real, fresh espresso. Since the espresso has such high water content, Kieran recommends boiling the espresso to prevent the finished ice cream from being icy. This is the same process for espresso flavoring that Kieran uses in is Cinnamon Latte Ice Cream, which I have also made. I’m not a coffee snob by any means, but I still pause to consider the flavor ramifications from boiling coffee. Twenty years ago, the percolator was a very common way for Americans to brew coffee. Today the percolator is typically found only at camping supply stores. Although I was hesitant to boil espresso for so long, the resulting flavor of this ice cream is anything but burnt. The espresso flavor is strong and very easy to differentiate from the Kahlúa flavor. This ice cream disappeared very quickly so I decided to make a second batch—this time using espresso powder. Espresso powder is typically made by freeze-drying espresso, so the espresso is never actually boiled or subject to high temperatures. The resulting ice cream was equally delicious, but the coffee flavoring was definitely different. With espresso powder, the espresso flavor was not as sharp and the broader coffee flavor also blended more with the Kahlúa flavoring; it was more difficult to detect the Kahlúa with espresso powder. If you really want a pronounced espresso and Kahlúa flavoring, stick with the fresh espresso. 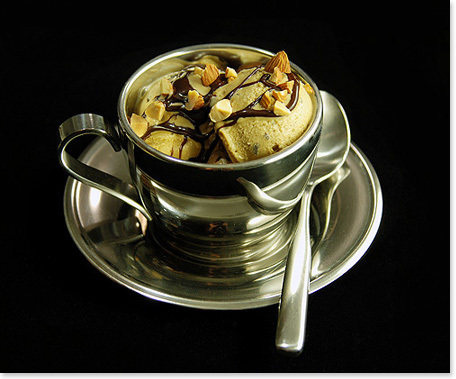 The espresso powder will yield a coffee ice cream more similar to what you might buy at the store. Either way, you’ll be out of ice cream in no time. 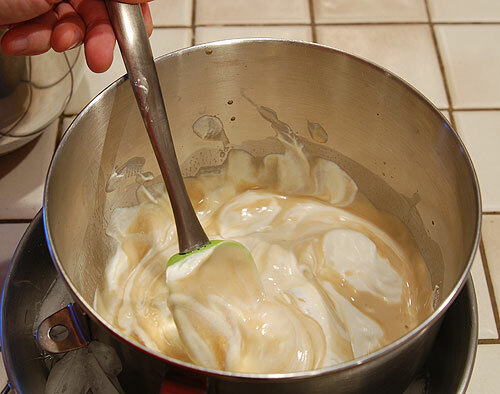 In the past, I have asked Kieran about whipping the cream separately and folding it into the chilled custard base before freezing since I had never seen this step in ice cream recipes. 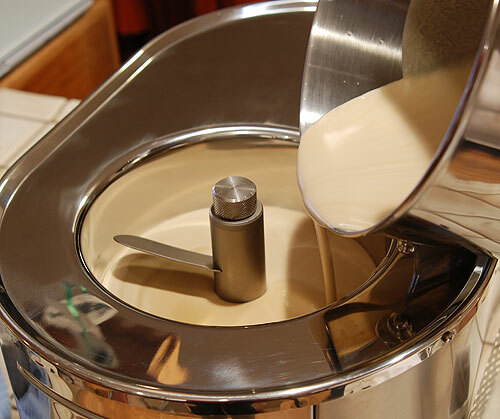 Kieran said that most home machines don’t churn the ice cream at a high enough speed to introduce enough air into the mixture. My Musso Lussino ice cream maker spins at a pretty good rate, so I had omitted Kieran’s suggestion in the past. 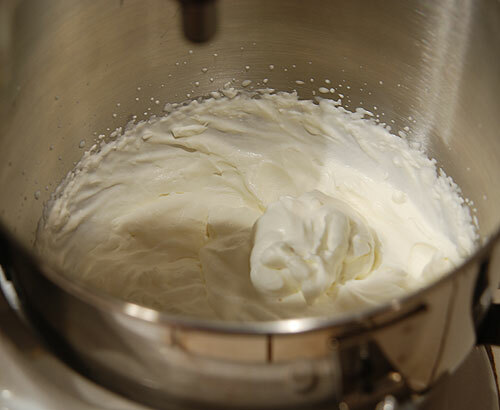 Since I was testing this recipe for his upcoming cookbook, I decided I would whip the cream as instructed. The finished ice cream was simply amazing and my wife also noted the fantastic texture of the finished ice cream, even after sitting in the freezer for a day. I’m definitely going to be making some modifications to my ice cream recipes to include this step. I just made 2 batches of my own vanilla ice cream recipe for Thanksgiving using this technique and was thrilled with the results. When whipping the cream, I think you want to just aim for soft peaks or else the ice cream may not fully blend in your maker. I’m betting too much air is not a good thing, though I haven’t tried pushing the envelope on this. This recipe is a keeper! Although I am already partial to coffee flavored ice creams, I have to say that this recipe is one of the best I’ve had. 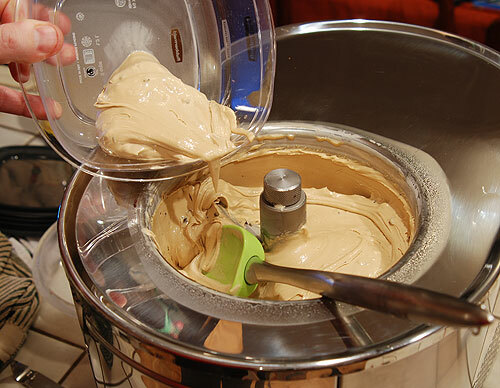 In fact, I’m already working on a variation for a true mocha almond fudge recipe. I’m looking forward to Kieran’s new book and will be sure to post an announcement here when it comes out. 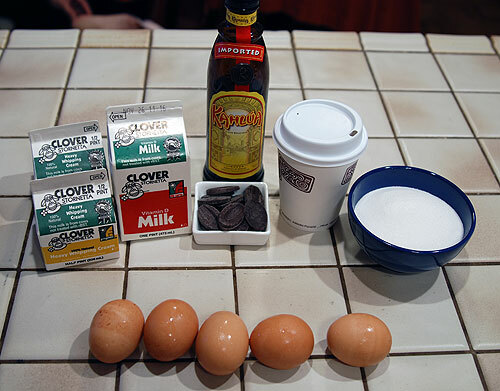 Ingredients for making Kahlúa Espresso Ice Cream. 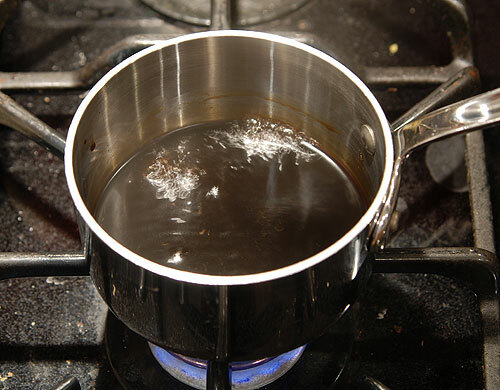 Boil 1/2 cup espresso (about 4 shots) and 1 tablespoon sugar until reduced to 1/3 original volume. 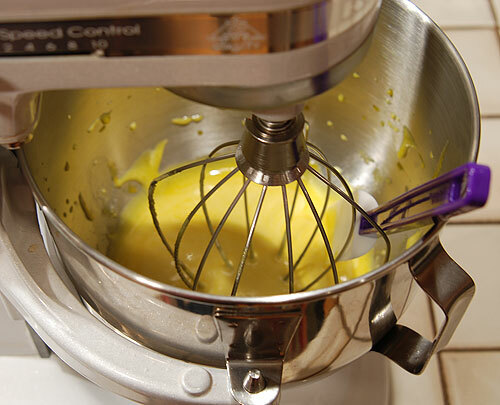 Mix 5 egg yolks and 1 cup sugar until light yellow and fluffy. 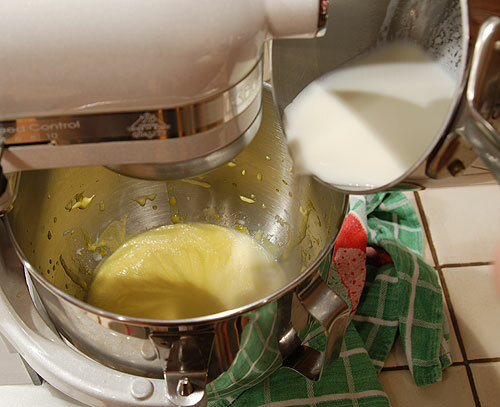 Slowly pour 1 1/8 cups of simmering whole milk into egg yolk and sugar mixture while mixing on medium low speed. 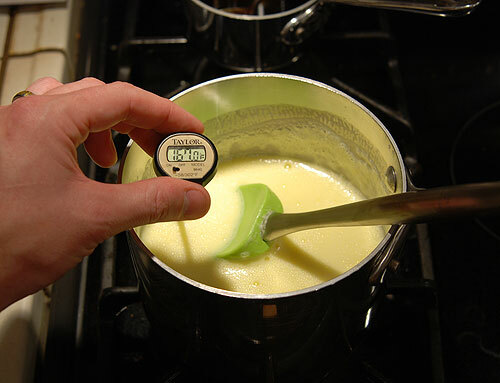 Return egg yolk, sugar and hot milk mixture to stove and cook over medium heat, stirring constantly, until it reaches 165 – 170° F. Chill mixture in ice bath until less than 45° F.
Mix in 1/4 cup of Kahlúa into custard base and blend. 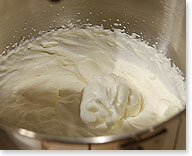 Whip 1 1/8 cups of heavy cream to soft peak stage and gently fold into chilled custard base. 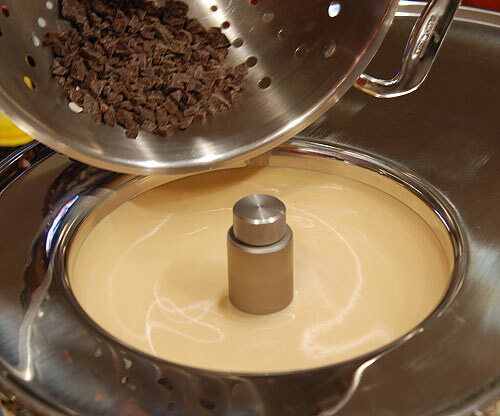 Add 2 ounces of chocolate shavings (or very small chunks) once ice cream starts to thicken a little. Transfer finished ice cream to dedicated container and let ripen in freezer for several hours. The recipe pictured above, with detailed instructions and complete photo gallery can be found on the Kahlúa Espresso Ice Cream recipe page or at Ice Cream Ireland. This entry was posted on Friday, November 23rd, 2007 at 11:22 pm	and is filed under Ice Creams & Gelatos, Raves & Reviews. You can follow any responses to this entry through the RSS 2.0 feed. You can leave a response, or trackback from your own site. Brian – what an amazing post. I am so impressed with both the detail and wonderful photos. I’m delighted that the cream-whipping worked out well. Thanks! Thanks so much Kieran. We really love this recipe. 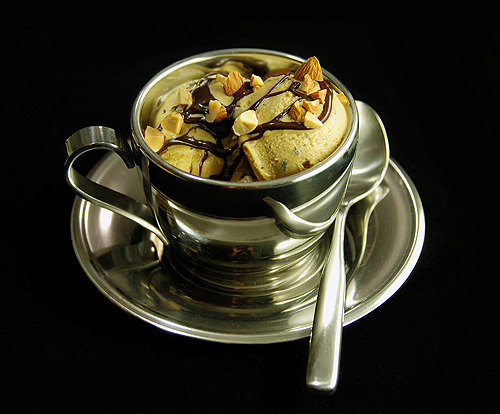 I’ve been craving a good coffee ice cream recipe and this one is absolutely fantastic! Looking forward to your book! You must have made this for me. Oh good lord that is delicious looking. Oh my, this sounds absolutely delicious! I think I just gained about 5 pounds reading about it! I like this recipe first time.